Good day for us as all 3 teams played and no losses. Girls start us off with 7:30 am game and won 3-1 vs. Swedish team with goals from Mini Meg Pitcock -2, and Payton Hasik. Boys A play on next field at 8:30 am vs. Norwegian team and tied 1-1. Eddie opened the scoring but we gave up an equalizer shortly after. Boys played well though. Boys B next as they played on the showcase field vs. Norwegian team and laid an egg. Nerves everywhere as tons of people watched the game, we tied 0-0 and were lucky to tie. Girls play again vs. a Norwegian team and won 2-1 but score was closer than the game as we dominated. They looked good today. Boys A end the day with a 3-1 win vs. a Swedish team as Eddie, Matt Pitcock, and Daniel Antoniou scored. Boys really looked good. Food is not at the level we have had but still decent regardless. I think we are a bit spoiled from Germany and Sweden but we are fine. I am eating it and tonight's dinner was excellent. Weather hot again, not a cloud in sight, 85 degrees and very little wind, Texas weather, love it. 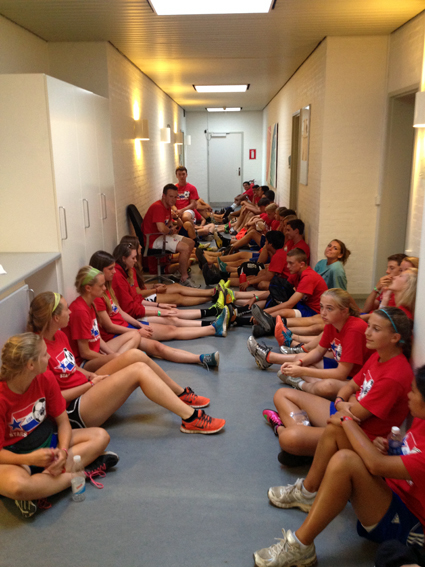 A few team sit-ups tonight but 10 pm curfew and kids are tired and another long day tomorrow.